Understand human anatomy for the purpose of studying movement. This continuing education course guides you through the bones, joints, muscles, muscle attachments, nerves, and blood vessels of the body with a full-color illustrated text. Understand human anatomy for the purpose of studying movement with this continuing education course. 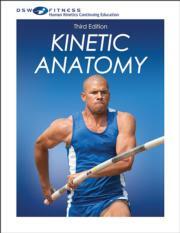 Kinetic Anatomy, Third Edition Print CE Course guides you through the bones, joints, muscles, muscle attachments, nerves, and blood vessels of the body with a full-color illustrated text. In-depth knowledge of the anatomical structures involved with physical movement will help you to identify and correct postural problems, prevent injury, and individualize exercise programs for your clients. Kinetic Anatomy, Third Edition, guides you through identification of all of the bones in the human body as well as their anatomical landmarks. You will be able to identify the ligaments and tendons that attach the bones and form the major joints as well as the major muscles of the human body. What separates this course from a standard anatomy review is the application of anatomy to specific training exercises of the upper and lower body and core and descriptions of the fundamental movements of the human body. At the conclusion of the course, you will take a continuing education exam to receive credit through participating organizations. Identify all the bones of the human body and their anatomical landmarks. Identify the ligaments and tendons that attach the bones and form the major joints of the human body. Identify the major muscles of the human body, their positions, and actions. Describe the fundamental movements of the human body. Identify the major blood vessels and nerves of the human body. Communicate using the universal language of human anatomy. Apply anatomy of the muscles to specific training exercises of the upper and lower body and the core. A continuing education course for athletic trainers and therapists, physical therapists and physiotherapists, and sports medicine professionals. Dr. Behnke spent most of his career at Indiana State University, where he was a full professor of physical education and athletic training and director of undergraduate and graduate athletic training programs. Earlier in his career he spent five years teaching at the secondary level. He has extensive experience as an athletic trainer both in high schools and at the university level, serving as head athletic trainer at Illinois State University from 1966 to 1969 and the University of Illinois from 1969 to 1973. He was an athletic trainer at the 1983 World University Games and for the U.S. men's Olympic basketball trials in 1984. During sabbaticals in 1982 and 1989, he served as an athletic trainer for boxing, men's field hockey, team handball, ice skating, roller hockey, gymnastics, judo, and cycling at the United States Olympic Training Center in Colorado Springs. He has been in demand as a speaker and an athletic trainer throughout the United States and internationally. "I will be able to explain the mechanics of exercise, along with the bones and muscles involved, to better visualize the targeted muscle that’s working. For clients with special needs or previous injuries, I will be able to explain what is going on in their bodies while performing a specific exercise and how it will help them overcome their current situation." "This course gave me greater knowledge of anatomy and a deeper understanding of movement and nerve relationship. Also, the course goes into program development, assessment, and developing movements and exercises for optimizing gym time." "This course gave me more knowledgeable of what muscle groups my clients are using when performing Pilates and yoga exercises. It was a great refresher from my original certification for Pilates and for yoga." "I gained an in-depth understanding of how the bones, muscles, nerves, and vessels relate to one another during movement. There are great illustrations and explanations. This information will enable me to do a better job of selecting appropriate exercises and understanding injuries and their causes."